Indianapolis – From team owners to team gophers, the employees of Team Penske and Target Chip Ganassi Racing wake up every morning intent on beating the corporate snot out of their IndyCar Series rivals. Race day takes it to another level. Penske mainstays Helio Castroneves and Ryan Briscoe know at some point during Sunday’s 93rd Indianapolis 500 they will have to contend with Ganassi counterparts Scott Dixon and Dario Franchitti. But first, each set of superstar teammates acknowledged that their fiercest rivals at Indianapolis Motor Speedway figure to be the driver they know best and trust most. That line of reasoning makes perfect sense to Dixon, the reigning Indy 500 and series champion. Franchitti, the 2007 Indy 500 and series champion while driving for AGR, certainly is a bona fide contender from his starting spot at the outside of Row 1. The fact that the Penske and Ganassi drivers hold four of the first six starting positions in the 33-car field is only the most recent proof that – given your preference – these are the undisputed super teams of open-wheel racing. However, both Franchitti and Dixon balked at the idea that they are somehow individually or collectively “super,” much less superior. Dixon, who has finished first and second in his last two starts at IMS, said he doesn’t pay attention to labels tossed out by well-meaning media. Recalling that 2007 Indy 500 and season-long battle with Franchitti, Dixon said the circumstances now are entirely different. “At that point you were definitely a lot more gung-ho in some ways,” Dixon said. “We’ve been friends since I started Champ Car in 2001, so we hung out a lot before that. We’re definitely a lot closer now. Dario and I are similar in a lot of ways and both respect each other and that’s key to trying to do what we want to do. Castroneves and Briscoe are in the second year of their pairing, in what has been a convoluted 2009. Castroneves sat out the season-opener at St.Pete as he, his sister and business manager dealt with charges of federal income tax evasion. Penske hired Australian Will Power during the offseason to drive Castroneves’ No. 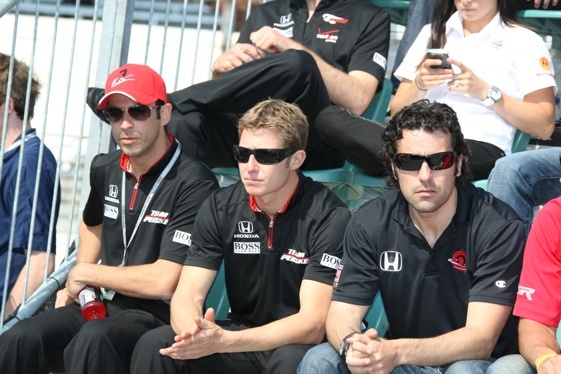 3 Dallara/Honda in case the verdict went against Helio. The three defendants were cleared of all but one conspiracy charge on April 17, and that final point was dismissed Friday. His legal problems over, Castroneves returned to the cockpit and finished seventh at Long Beach and and second to Dixon at Kansas Speedway in the season’s first oval-race. On cue, Castroneves put together a four-lap/10-mile qualifying run here at 224.864 mph that secured his third Indy 500 pole. That said, Briscoe added he fully understands why Castroneves considers him a bigger threat to his chances of winning a third Indy 500 than arch-rival Dixon. Basically, the Penske drivers have been lapping in lockstep for the Month of May. “I don’t think we’ve (he and Helio) hit the track once since after qualifying without being together on the racetrack,” said Briscoe, a 27-year-old native of Australia. “We have been waiting for each other, and we leave the pits together and do our long runs together and it’s been perfect. We’ve been working together, making each of our cars faster and faster from his input and from my input and using Will’s input as well. Of course, the storybook script here would see Castroneves rolling into Victory Circle after his hellish six months capped by a six-week trial to swig the traditional milk.